Word Search Sudoku appeared in World Sudoku Championship 2009 and this current puzzle, I created before WSC 2009 for the practice to Indian team. From last five years I have not published this puzzle anywhere. In fact this puzzle was lost from my computer and suddenly few months back, I found this Word Search Sudoku my mails. 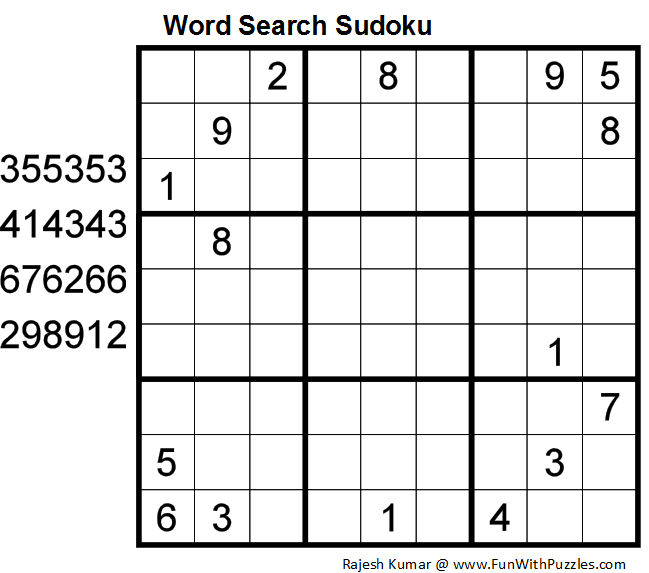 After World Sudoku Championship 2009, I have not seen this Sudoku type in many of the online championships. This Word Search Sudoku is my 87th contribution for The League of Extraordinary Ladies and Gentlemen. Classic Sudoku Rules apply. Additionally the “words" formed by numbers given can be read in the puzzle in one of the eight directions (horizontally, vertically or diagonally).